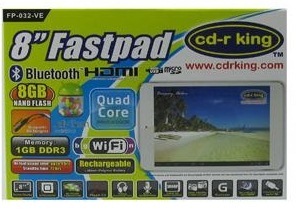 CD-R King has just unveiled its 8 inch tablet called Fastpad FP-032-VE, literal name with technical meaning, FASTPAD by the name itself carries 1.2GHz quad-core Actions ATM7029 processor, Cortex A9. 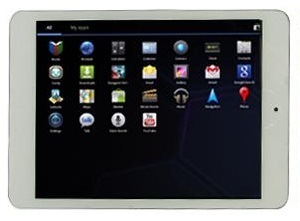 Running on the latest Android software Jelly Bean 4.1, CD-R King FASTPAD is also powered with 3D graphics rendering video card called Mali-400 GPU. Additional spec to prove its name, Fastpad has been equipped with a desirable RAM of 1GB, carrying the tablet anywhere has never been the issue cause it only weighs 360g or equivalent to less than a 1/2 kilo of Sugar at your palm. :p Priced at Php6,580 and available nationwide. In case you miss it, Fastpad is priced at Php6,580 | Availability may vary in some location, it might take some time to be available nationwide at once, be sure to share availability in your area using our comments. If you happen to have tablet, kindly share your experience with us! Thanks. Specs-wise, halos pareho lang siya ng CM Fusion Bolt/Ainol Novo Venus but with a better GPU and storage size. Kaso I don't think this is enough to justify the extra 2K. I have to say that CM Fusion Bolt's screen is better than this one (7in HD IPS Display vs 8in XGA display). I own the Fusion Bolt and I love the screen.